The Guru301 add-on is currently in beta. Guru301 is an add-on for providing redirect functionality from your root domain (like example.com) to a subdomain (like www.example.com). Because a root domain cannot use CNAME DNS records, you must use an A record that points to a static IP address. Most cloud platforms like Heroku do not provide static IP addresses out of the box, because of their dynamic nature. Guru301 solves this problem by giving you one or more static IP addresses backed by rock-solid, high-availability redirect servers, allowing you to use your root domain with your Heroku app. To follow SEO best practices, Guru301 issues its redirects with the 301 HTTP status code. This code is remembered by search engines, allowing you to consolidate your “link juice” to a single domain rather that splitting it, resulting in better page ranks. After you install Guru301, you will need to configure your redirect in the web dashboard and update your DNS settings to fully integrate with the add-on. 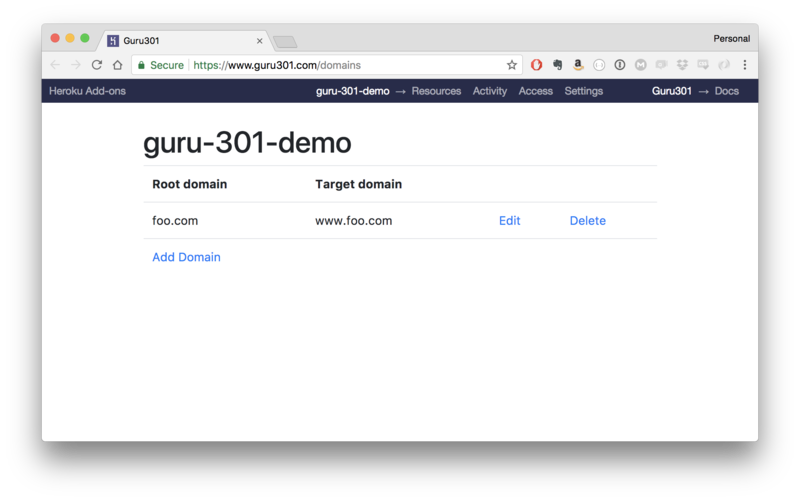 The Guru301 dashboard allows you to configure the redirect from your root domain to a subdomain. or by visiting the Heroku Dashboard and selecting the application in question. Select Guru301 from the Add-ons menu. Enter your root domain and the subdomain you’d like to redirect it to. Log into your DNS provider and create an A record that points your root domain to the IP address stored in GURU301_IPS in your heroku app config. If you are on a plan that gives you multiple IPs, you can create multiple A records. It can take some time – up to 48 hours in the worst case – for DNS changes to propagate. You can use the host CLI command to inspect your domain’s DNS configuration. Changing plans will provide you with new IP addresses for your A records, but your old address(es) will continue to work in the meantime, so you will not experience any redirect downtime. This will remove your redirect functionality! All Guru301 support and runtime issues should be submitted via one of the Heroku Support channels.